NOTE: Several people raised good questions about the table that originally appeared with this post. Essentially, the issue was at what RPE/heart rate should a score of 100 occur. The points were well made so I've adjusted the chart to what you now see below. Last week someone asked how I estimate Training Stress Score. My answer was a bit sloppy since the formatting of tables is all messed up in comments fields. This had all started when I posted a blog on how to project fitness and form during a Peak period using WKO+ software. Before getting at the table below to show you how to do this, I should provide a little refresher on Training Stress Score. • and “3600” is the number of seconds in an hour. Once you have an estimated TSS plug this number into your WKO+ software on the Calendar page. To do this right click on the appropriate workout date, select “Create a New Workout”, click “Save”, and then right click the new workout selecting “Override values” from the pop-up menu. Type in the estimated TSS and you’re done. Easy, huh? Actually, it gets quite easy as you become accustomed to it. I hope this helps, but if not please let me know your questions. I found this recently after seeing your TSS numbers in your tweets. I like yours better and thanks. Training Balance is another good thing to track to time your fitness for certain events. So the above claims that it's impossible to work out at intensities that you cannot maintain for an hour. A 20 minute maximal effort should produce a higher TSS than 33 1/3. Also, the idea that 1hour at FTP equates to a heart rate zone of 5c is again rather odd, no-one can maintain that heart rate for an hour. So if you were right with the table, no-one could do their FTP, which by definition is impossible, FTP is what a person can do. Very disappointing post. Please fix it! 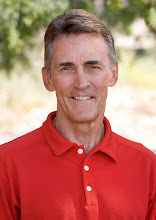 Hi Jim--Thanks for your comment. I must not have done a very good job of explainig this. Hence your confusion. You can hold any TSS value up to 100 for an hour. But you cannot maintain 100 TSS/hour beyond an hour (you can hold lesser TSS values for beyond an hour). The reason why is that the Intensity Factor of 1.0 is defined as the maximal effort one can hold for an hour. So therefore trying to hold it for beyond an hour is impossible by definition. The question about HR 5c relates to Example 3 above. I was trying to show that portions of a workout may be scored individually. This might include short intervals done at highest intensity. I realize that HR 5c is not realistic even when doing very brief efforts since HR lags power/pace by quite a bit. In this case RPE is much better. You might read Allen and Coggan's book Training and Racing With a Power Meter to get a better grasp of the components of the TSS formula. I hope this helps you understand what I was trying to explain above. Hey Joe, great article. Thanks. Does this same technique work for a weight workout for legs? Would I have to use RPE for each set and then add them all together? 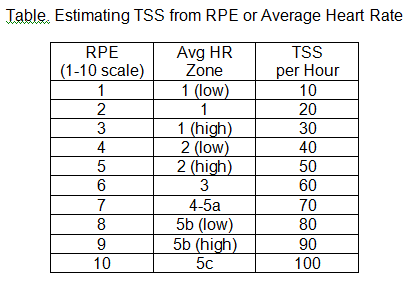 Would the TSS be similiar to an intense bike interval workout, with very short extremely hard efforts (RPE=9 or 10) followed by a longer rest period? But, it seems like even a short hard leg workout with weights is far more intense and tiring than a comparable short interval bike workout. I am a cyclist and I use your book together with the Hunter and Coggan book and WKO+ for training. 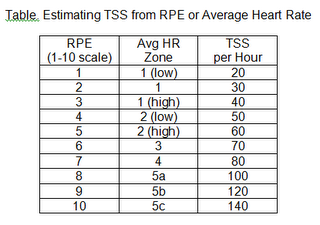 Looking at the table, zone 4-5a should be most people's 1 hr time trial pace hence the TSS should be 100. For zone 5b where where I try to hold for around 5 minutes the average power normally is about 25% above FTP hence TSS of 156 per hour. Lastly my feature request for WKO+ is when you put in a workout manually there is no zones like you described. You have to do all these calculations before punching in one number. Otherwise you need to create multiple workouts to achieve the same thing. robnfl--Good question. I've never toyed around with that. It would more than likely be RPE x duration. Tell me what you come up with after trying it. Mark has already addressed some of the problem I had clearer than I did, but the problem with the table is that for a 5 or 20 minute effort you can comfortably do more than 100 TSS per hour, because it's for a fraction of an hour. And the RPE for these short durations are high. RPE 10 is a minute most for me, RPE 8/9 for the 5 minute interval. So for a 5 minute interval in a recent ride I had a TSS of 13, well above the 100 an hour. Over 150 an hour. As Mark notes moving the RPE-7 to be 100 and having 8/9/10 over a 100 would be more in accordance with what a power meter gives. Certainly highlighting that you cannot do RPE > 7 for more than parts of an hour would be a good idea. As it stands it would lead to people seriously underestimating their TSS. Which wouldn't be a problem if they only estimated, but if they combine it with actual measurements it would not be such a good thing. Can you do the same analysis on Training Peaks website or only WKO+ have these tools? Fabiano--Only WKO at this time. If I were to put in my PB for 1 hour race as the FTP value - meaning that my best 1 hour workout will produce a TSS of 100. Other than that, all my 1 hour workout should produce TSS of less than 100, am I right? Another question on the Threshold setting. WKO+ allow me to update my FTP and setting an effective starting date and it re-calculates the whole workout records. What if my FTP been improved by a few times. How do I update my FTP value? If I put in my latest FTP value, my previous records (where I was having a lower FTP then) TSS score will be lowered and hence all the reading in the Performance Management Chart will be affected. NT--Yes, that's right on the less than 100 TSS/hour for workouts less than FTP. On the second question... when you change your FTP on WKO it only affects future workout data. Previous data is still based on the FTP as of that date. Thanks for fixing! All clear now. off topic question...how do you paste workout graphs in your blog? I can copy and past all the graphs in my journal (distribution charts, summary, etc...) within tpeaks, but I cannot figure out how to copy/paste the main graph. Based on your table Training Peaks could add one functionality to their online software or WKO+ where estimated TSS would be automatically calculated using the Time in Zone (Heart Rate) graph data of each workout. Of course, you must have a heart rate monitor that records heart rate data every second and allows one to download this data from the monitor. Long time follower from Sweden but first time to post. If you don´t use WKO+ and want to calculate training load should you add TSS to a second work out if you do two in a day or can you say one TSS 100 run is the same as two TSS 50 runs? Hope you understand my Q. Thanks for a interesting blog. Joakim--Thanks for your comment. Until software becomes more sophisticated, a 100 TSS day is the same as a 2 x 50 TSS day for a given sport. However, we know that with fatigue one's FTP (Functional Threshold Power/Pace) declines with fatigue. A hard 50 TSS workout in the morning may produce enough fatigue that later in the day your FTP is reduced by, let's say, 5%. That would mean your second workout which may have been 50 TSS before would now be something more like 52.5%. But that day appears to be quite far in the future. Consider a balanced triathlete, that is someone who's ability (for instance relative to their AG) is about the same in each sport. Is a TSS of, say 100, sport independent? 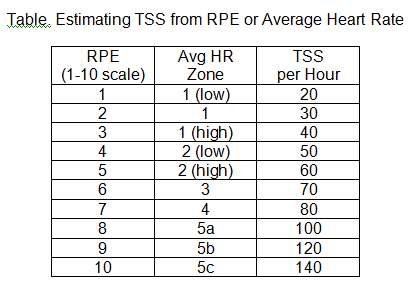 So if you are, for instance, using TSS as a measure of hard/easy days do you also have to "correct" for the fact that, for example, a 3 hr steady run is not the same as a 3 hr steady bike but your HR TSS would be the same, right? Also I understand how you would use power for TSS in cycling but unclear on the value of running pace, which (where I live) would be highly route dependent. And would it really solve the above 3 hr workout comparison? Thanks for getting this information out to the community. I look forward to applying it in my training. TSS is the same across sports. For ex, a 50 TSS on the bike counts the same as a 50 TSS run. Both are numbers based on the FTP for that sport and the duration of the workout. Typically, longer workouts may be done on the bike than on the run (but not by all athetes, for ex, ultrarunners). This simply means you can accumulate more TSS on the bike than you can running. You can analyze run pace if you use WKO+ software as you have something called 'normalized graded pace.' This means the software calculated what the pace would have been had your uphill portion of a run been flat. However, it's currently not possible to prescribe workouts with NGP. But I expect some bright engineer at one of the device makers will soon see the light and realize this can be done. With NGP on your device you could observe real time 'pace' during workouts. No answer for my inquire? ?